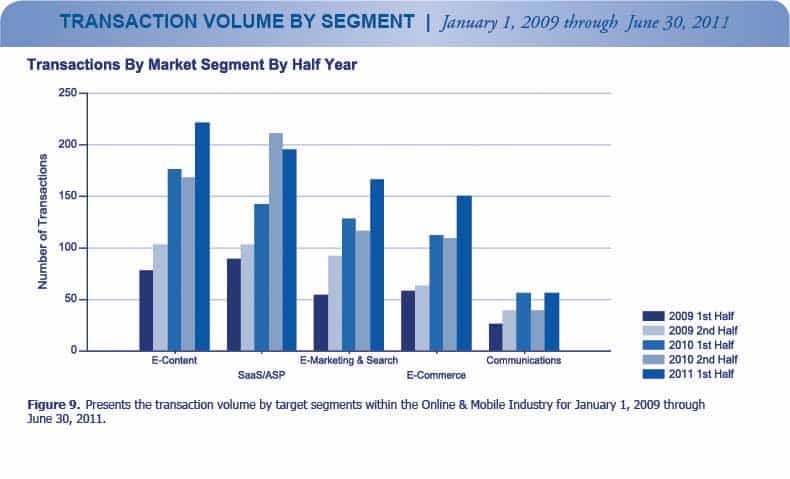 1st Half 2011 Online & Mobile Industry Trends - Berkery, Noyes & Co., LLC. The largest transaction in 1st Half 2011 was Microsoft Corporation’s announced acquisition of Skype Technologies SA, from an investor group lead by Silver Lake Partners, for $9.08 billion. Google, Inc. was the most active acquirer in 1st Half 2011, with 11 purchases: SageTV, AdMeld Inc., PostRank Inc., Sparkbuy Inc., TalkBin, PushLife Inc., BeatThatQuote.com Ltd., Next New Networks, Inc., FFlick, SayNow and eBook Technologies Inc. There were 82 financially sponsored transactions in 1st Half 2011, with an aggregate value of $3.58 billion,representing 11 percent of the total volume and 11 percent of the total value,respectively. Total transaction volume in 1st Half 2011 increased by 23 percent over 2nd Half 2010 from 643 in 2nd Half 2010 to 788 in 1st Half 2011. 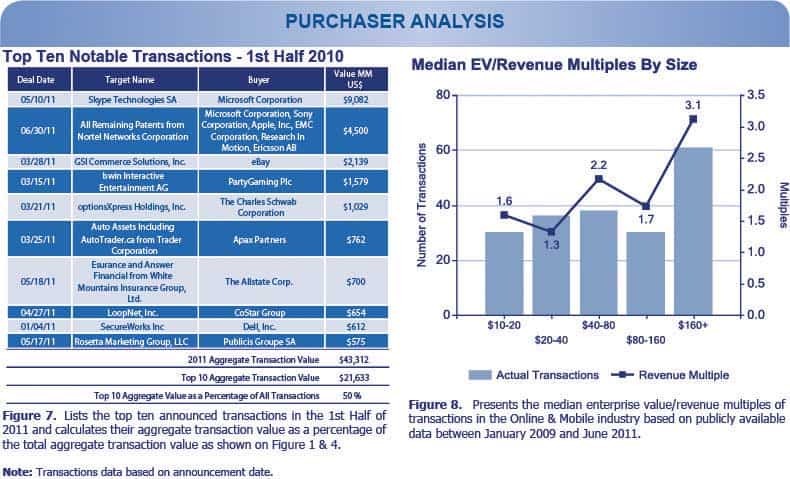 Total transaction value in 1st Half 2011 increased by 52 percent over 2nd Half 2010 from $28.46 billion in 2nd Half 2010 to $43.31 billion in 1st Half 2011. 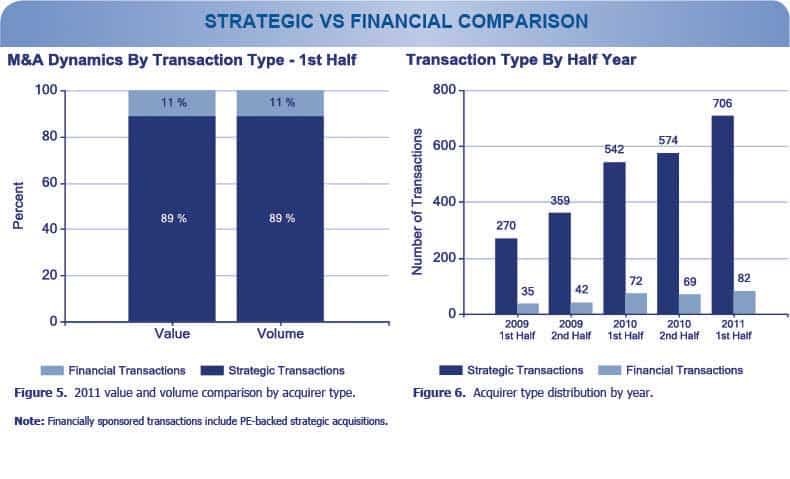 The segment with the largest increase in volume in 1st Half 2011 over 2nd Half 2010 was Communications with a 44 percent increase from 39 transactions in 2nd Half 2010 to 56 transactions in 1st Half 2011. 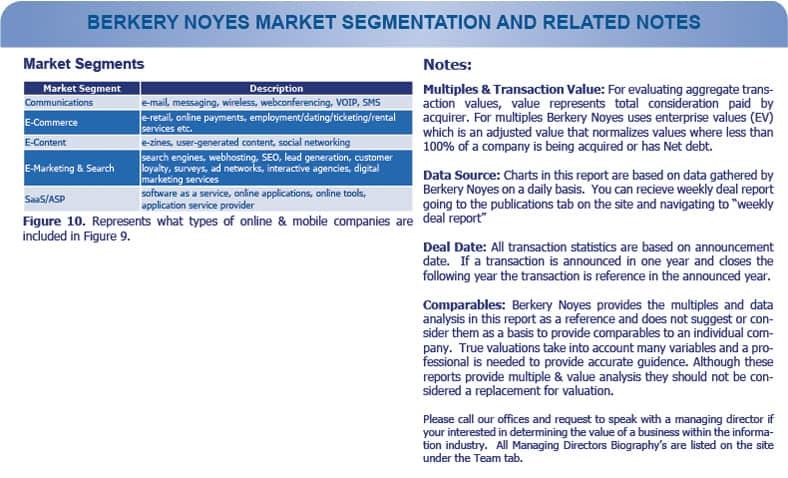 Berkery Noyes tracked 2750 transactions between 2009 and 1st Half 2011, of which 797 disclosed financial terms, and calculated the aggregate transaction value to be $84.8 billion. 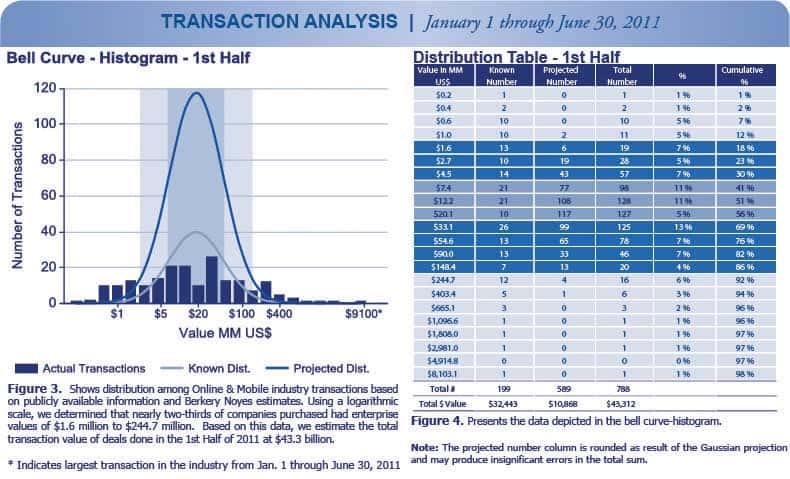 Based on known transaction values, we project the value of the 1953 undisclosed transactions to be $28.2 billion, totalling $113 billion worth of transactions tracked over the past two and a half years. The most active acquirer over the past two and a half years was Google, Inc., which made 39 transactions. 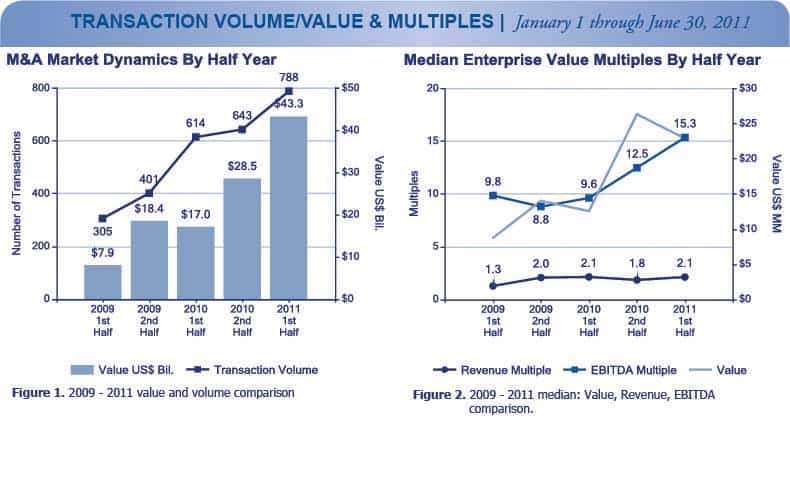 Disclosed median enterprise value multiples between 2009 and 1st Half 2011 for all segments combined in this report were 11.44 times EBITDA and 1.80 times revenue.